I have been trying yesterday and all of to-day to write to you, and I simply couldn't find a chance. There have been girls in the room practically all the time, and we have done nothing but talk, talk, talkall day long. It is fine seeing them all again and I am having a lovely time with them all. But, oh dear, I am so homesick, and I do so want to see you, my own darling, and everybody at home. I declare it is just awful being so far away from everybody!I had a very easy time at Washington. I just got the porter on the train to give my things to a porter on the platform and he took me right to the train. I didn't even have to go through the gate just around from one platform to another. It is alright about the telegraphing, dearie, because Mother did it from home as I thought she probably would, and Miss Thomas, Louise and Sarah Jones were all down there to meet me. The train was about forty minutes late so I had only milk and crackers for dinner but it was enough as I wasn't hungry. This morning we went horseback riding again, and oh it was such fun. I hadn't done it for so long and we had such a fine time. It is just the best fun in the world, I think. And don't cough so loud. 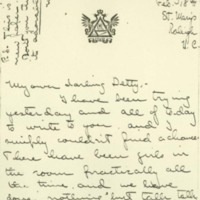 McAdoo, Eleanor Wilson, 1889-1967, “Eleanor Randolph Wilson McAdoo to Jessie Woodrow Wilson Sayre,” 1907 February 18, WWP17372, Jessie Wilson Sayre Correspondence, Woodrow Wilson Presidential Library & Museum, Staunton, Virginia.